James Poyner, Thomas Hopkins, Oliver Hopkins had their heads shaved by hairdresser Hayley Johnston. 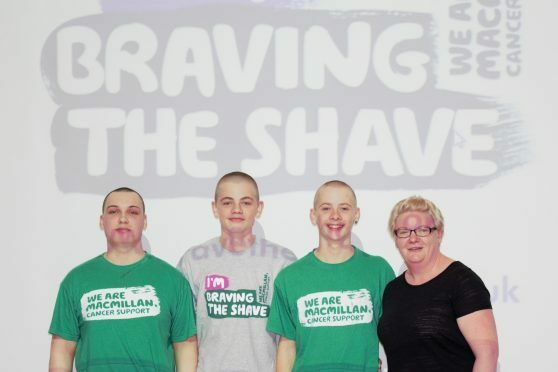 Three Moray school pupils have had their heads shaved to raise money to fight cancer. Thomas Hopkins, who attends Milne’s High School, came up with the fundraiser after his stepfather Marc Macrae, who is a Fochabers Lhanbryde member at Moray Council, fought off the deadly disease. The 15-year-old enlisted the support of his older brother Oliver, 16, and his classmate James Poyner, 16, to add to the total. A massive crowd paid to watch the three teenagers have their floppy hair shorn off by hairdresser Hayley Johnston – raising £720 for Macmillan Cancer Support in the process. Thomas and Oliver’s mother Sarah Macrae provided moral support for the boys while filming the radical makeover. Mr Macrae joked it was a “fantastic effort” from the teenage boys “knowing how much they love their hair”. He added: “Many of us have lost close family and friends to this most terrible of diseases. Thomas and Oliver say this at first hand when I fought my own battle against cancer. “It was something that was so much easier to deal with having the support of my family behind me.